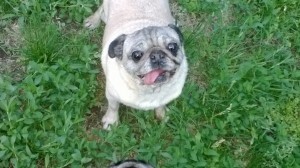 Ariel is a very sweet pug that is hard of hearing and seeing but that’s to be expected as she’s had a hard life. She has a hard time walking but is getting supplements to help with her arthritis and a painkiller too. She needs her food softened for her and she needs help going up stairs which is understandable. She hates to be left alone and barks but LOVES any love and attention. She is a little afraid of being petted but loves playing with other dogs. She needs some special attention for her final years. Could this be you? Update from foster home – She has gained a little weight. She barks a little when I leave or come home. She is trained to potty pads but still has accidents a lot. She needs a home with other dogs. She is very scared of humans, especially kids. I give her glucosamine everyday for her arthritis and I sometimes give her pain pills if I notice she is limping more than usual. Whomever adopts this dog has to be used to having an elderly dog. She can’t go upstairs. She hates being picked up but she will come let you pet her. Mostly she just sleeps and cuddles with my other two pugs. She follows my male around everywhere.